And so the campaign in Russia continues. Around the village of Nava, Marshal Davout with his corps and a few attachments made contact with a strong Russian force entrenched in redoubts behind the river. Guns were spotted in redoubts behind the main bridge that separates Nava major from it's 2 southern suburbs, and covering all the major fjords that could be used by us to cross. Davout really wanted to give the enemy a bloody nose here so he set to work issuing orders and reconnoitering the ground. He discovered what fjords could be used and what woods were surrounding the village to provide cover for our advancing troops. As an aid in his staff, Marshal Davout tasked me with 2 divisions of Saxon infantry and 1 of cavalry and 2 divisions of Bavarians to attack the left fjord and the village frontally while he attacked with the majority of our force on the right against the Russian left flank. He wanted the Saxons to demonstrate towards the fjord, and lock in the forces protecting that crossing while using the Bavarians to capture the southern suburbs of Nava and clear a crossing to the right of the town and into the woods that dominate that area. He gave me all the alied artillery to utilise and stressed a bombardment of the town would be beneficial. 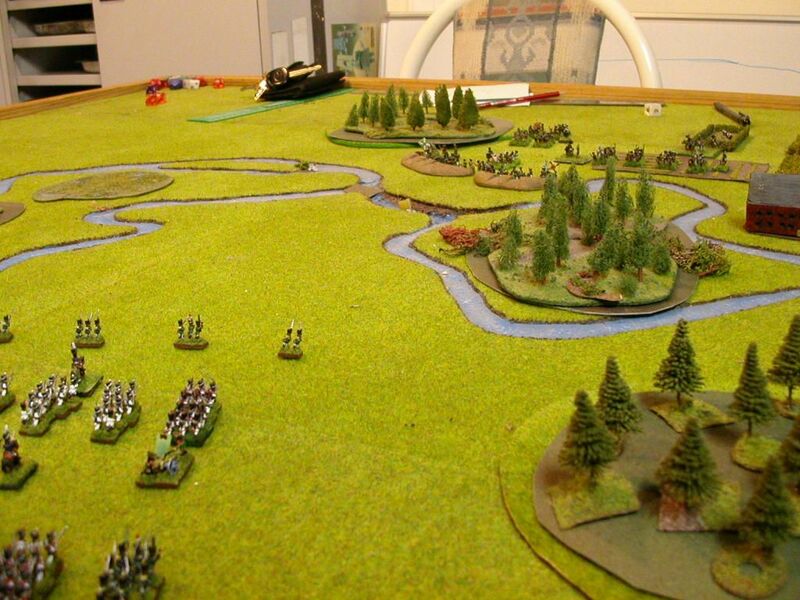 On the right of the battlefield where Davout will attack, there is one river fjord and a pontoon bridge our engineers built last night. 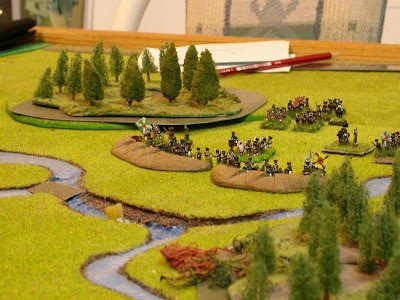 Neither point is defended immediately but at range behind a couple of hills and redoubts. The Russians have massed their guns and formations behind these hills in line that runs from the river just east of Nava to the NorthEast. This is where Davout will attack. At first light, his formations began crossing the river at these 2 points while I advanced my Saxons and Bavarians forward for their own objectives. On my sector of the battlefield, I pushed my Saxon division towards the left fjord with a light cavalry division to its left for support. Behind it is a 2nd Saxon division. They all move with a skirmisher screen deployed forward enough to threaten the crossing but not close enough to take considerable damage from the Russian batteries across the river. 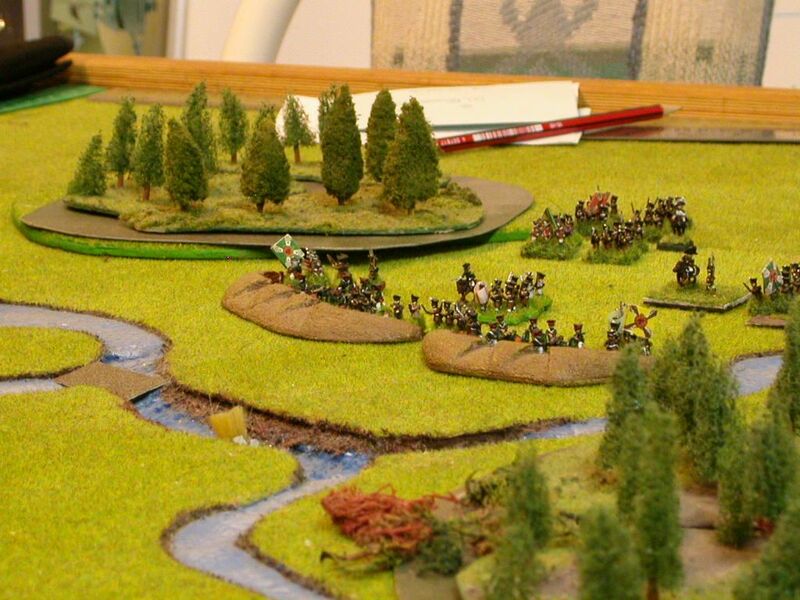 My two Bavarian divisions move forward up the central road towards Nava. The lead division splits it's two Brigades, sending the 1st towards Nava and the second to the right towards the fjord to the east of the town. My orders are to capture push the Russians out of the 2 southern suburbs of Nava, the ones on our side of the river and also to secure the fjord to the right of the town and if I can, to clear the woods of any enemy. As my Bavarians survey the crossing point on the river, they spot Russian Jager in the woods. This will make for an interesting crossing. To capture the village suburbs, I decide to harrass 1 suburb with skirmishers and artillery while I attack the other with 3 battalions supported by corps engineers and the divisional commander. It falls in my 1st attempt and cleared within minutes.